WASHINGTON (May 15, 2009) -- Twenty-six Reserve Officer Training Corps cadets from Georgetown University's "Hoya Battalion," were sworn in to service to the Army, May 15, by the Army's highest ranking officer. Chief of Staff of the Army Gen. George W. Casey Jr., himself a graduate of the school and former member of the school's ROTC cadet corps, spoke to the cadets before commissioning them as second lieutenants. 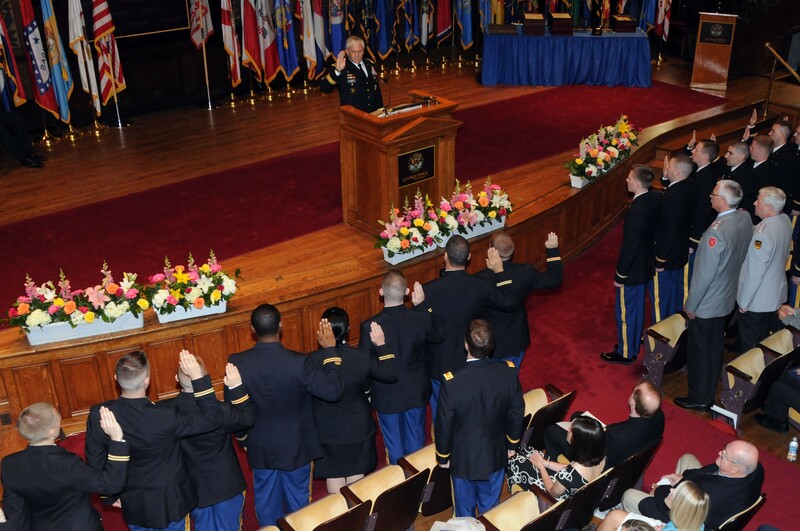 Chief of Staff of the Army Gen. George W. Casey Jr. administers the oath of office, May 15, to 26 Reserve Officer Training Corps cadets at Georgetown University, Washington, D.C. The cadets will now serve as second lieutenants in the Army. "You're terrific young scholars, athletes and leaders -- and our country needs you to be all of these," Casey said. The general also spoke to the cadets about the Army they would soon enter. "You're joining an organization that is already the best in the world at what it does," he said. "An organization that has been at war for nearly eight years. A combat-seasoned, all-volunteer force that believes our freedoms are worth defending." Casey told the cadets their training, their schooling and the values they brought from home would all be put to the test once they entered service. "In a short time I have no doubt you will face tough situations," the general said, saying that the values they learned from their parents and the training they will get from the Army will keep them grounded. "You will do the right thing and you will set and uphold standards while you are doing your missions. And your subordinates will render respect to you sight unseen. And once you reach your first assignment and you realize these terrific combat-seasoned Soldiers depend on you, you will vow never to let them down and you will embody what we call the warrior ethos." Casey asked the cadets to raise their hands, and administered the officer oath to them. This year, more than 4,500 ROTC cadets -- part of 272 programs located at colleges and universities throughout the 50 states, the District of Columbia and Puerto Rico -- will accept commissions as second lieutenants into the Army. "The ROTC is our largest source of commissioned officers, and frankly, because of the number of colleges that have ROTC programs, it gives us great diversity from across the country," Casey said. "That's one of the strengths of the ROTC program." The general also said the ROTC program brings youth to Army leadership. "They bring new life -- it's a new injection of youth and every organization needs that regularly," he said. "People always ask you what level of command did you like the most. Mine was battalion command, because that's where you dealt with these brand new lieutenants. And you shape them and mold them into effective and vibrant officers." The new second lieutenants will graduate from several Washington D.C. area schools, including Georgetown University, American University, Catholic University of America and George Washington University.